The Synology DS1511+ NAS is perfect for the small business or advanced home user. It’s packed with features that can all be accessed using an attractive web based GUI. It’s perhaps overkill for the average home user but if you want to really explore and configure all the capabilities of this NAS it can become a full time hobby and very useful once configured to your liking. 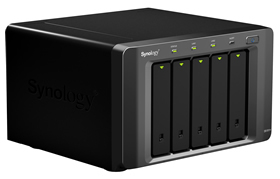 Synology has a list of hard drives that it recommends for use with its NAS lineup. All the big players have drives that will work with the DS1511+ and you can mix and match sizes if you choose. It all depends on how mission critical the data on the NAS will be. Since we were reviewing the Hitachi Ultrastar 7K3000 drives when we received the DS1511+ the timing was perfect. These are ideal enterprise level 3TB drives and a good test for a state of the art NAS installation. The drives easily screw to removable rails that slide and lock into place. Synology includes two sets of screws for different hard drives. Once attached to the rails just a little force is required to make full contact with the power and SATA connectors and to lock the drives in place. The DS1511+ is solidly built with two fans for cooling. It’s very quiet in sleep mode and depending on the hard drives installed fairly quiet during operation. The Hitachi Ultrastars make quite a bit of chatter when reading and writing so a strategic location where noise is not an issue may be important depending on your setup. Good airflow is a requirement as well to keep the drives running cool. Preparing all five drives to run the Synology Hybrid RAID takes the better part of a day with full disc scan to ensure no bad sectors are encountered later. That may sound like a long time but that’s actually pretty good for preparing five 3TB drives. We used a single volume with multiple shared folders and 3 computers synched to the DS1511+. The initial synchronization can take some time depending on the amount of data. Once synched the NAS will monitor any changes in the “watch” folders and stay current with any new files or new revisions of existing files. It’s very seamless. Synology also has smart phone apps to remotely access files on the DS1511+ if you choose to expose the NAS externally to the net. This was much more compelling before Google unveiled its ‘Music’ service. We suspect even more cloud apps of this type to proliferate for access to myriad media files. Still, having the ability to access the NAS remotely and have complete control over the experience can be very useful. So, the DS1511+ offers way more capabilities than the average user will ever tackle and plenty more that any user will appreciate such as the "download station" and direct USB connectivity. However, if you’re looking for a full featured NAS will all the bells and whistles and are willing to put on your IT hat for a weekend your reward will be a very powerful data management and backup solution. Visit Synology for more information.